I ran across several articles in Eyes and Ears about the basement of the Magic Kingdom. I know we call it the Utilidor today, but most cast members and Disney publications referred to it as the Magic Kingdom Basement, or just the basement. They did a refurbishment of the Magic Kingdom Utilidors in 1975 after a few years of the cast asking for newer facilities and more break areas. Let’s take a look at some of the things they did! In case you’ve been wondering if your eyes are playing tricks on you down in the Magic Kingdom basement complex … no, they haven’t. The walls have gone from blue to green and now orange, and coming up next week … red, white and blue! That’s right, this is all part of our ongoing backstage beautification program. Down in the tunnels, painters have been busy over the past weeks giving the tunnel under each land its own identification and look. As of this writing, Main Street basement has turned from light blue to green, Adventureland/Frontierland has taken on an orange hue and right at this very moment, painters are giving the walls under Liberty Square its new look … red, white and blue stripes! Yet to go are Fantasyland, Tomorrowland and the tunnel entrance complex. As we jump ahead to November, 1975, we see more details about the changes for the Magic Kingdom Utilidors, including the graphics being used for the different lands. EYES & EARS this week unearthed some facts that a big cover-up is underway at Walt Disney World, and almost complete. However, this cover-up is not done with words …but with paint, some great new graphics and a lot of imagination. 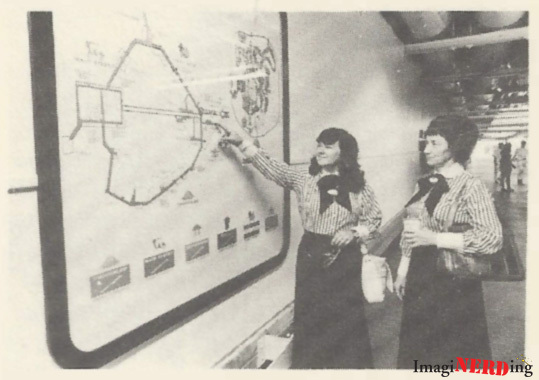 Dot Greenman (l) and Edna Osborne (r) of Main Street Merchandise get the “big picture” of our basement network system from a new directional map in the Fantasyland tunnel across from the time clock station. Strategically located to assist new employees as they enter the basement, another will soon be put up under Main Street. 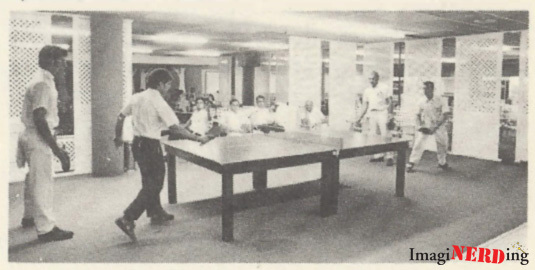 Yes, they’re playing Ping-Pong in the Magic Kingdom Utilidors! If you haven’t visited the basement complex lately, then you should. We have been reporting the project’s progression over the past months, and it is now near completion. Each “land” has its own logo and color for identification, there are new directional arrows located throughout the complex, breakrooms have been rehabed and super graphics adorn many before blank walls. Tony Virginia, Superintendent of Grounds Maintenance, told us that crews will be coming back and adding some door graphics, elevator graphics and signs telling you where stairs lead to. Also in the works are another large directional map to be located under Main Street and ”themed” trash cans throughout the tunnels. I’m always surprised and excited when I run across Disney logos that aren’t what we’ve really seen before or expected. These logos, by far, speak volumes about the areas and lend a bit of the theming to the Magic Kingdom Utilidors. 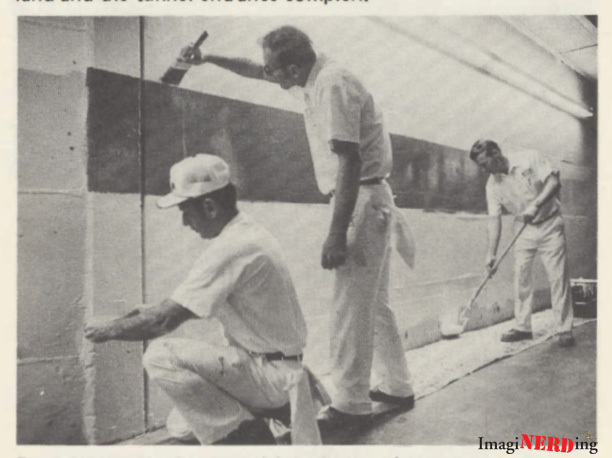 I would love to have seen them in full color with the painted walls of the Utilidors. Even if they were just adhered in black and white, they’re still very simple and powerful logos. The fact that Disney waited so long before they started to theme the basement area is interesting. Granted, they were under deadlines to open by October 1, 1971 and most resources were shunted towards the on stage areas. I wonder if the addition of the theming was due more to cast complaints or the fact that Disney was hiring more people and needed easier and simpler way finding tools. What do you think about the Magic Kingdom Utilidors from 1975? I can’t decide between the Adventureland or the Tomorrowland logos. Which one is your favorite? Looking for a great book on the first few years of the Magic Kingdom and Walt Disney World? Check out the Story of Walt Disney World: Commemorative Edition. Basement? I never heard it called that. We always called it “The Tunnels”. Tunnel rule one, never use the stairs or elevator next to a restaurant unless you have a low gag reflex. I always loved the Tunnels and they do go many places but not as far as I expected.